The rural house Los Draguitos is located in Malpaís, the southern part of Mazo. With its own private swimming pool, 3 bedrooms and 2 bathrooms, it's ideal for up to 6 persons. And the beach is just a 20 minute drive away! Los Draguitos, named after nearby Dragon trees, is built mainly of wood and local stone providing a welcoming home. Newly refurbished, it is decorated with warm, earthy colours to complement the original wooden features such as floors, window seats and ceilings of tea wood, the heart of the Canarian pine. The three bedrooms each have a double bed. Enjoy the hydromassage bath in the main bathroom! A second bathroom also provides a shower, toilet and washbasin. Outside, the private pool adds an extra attraction, particularly on hot days. The dimensions of the pool are: 6m length x 4m width and the depth ranges from 1.70m to 2.10m. The view overlooking the sea from Los Draguitos makes this an ideal place to watch a beautiful sunrise, and as night falls to enjoy the island’s excellent dark skies – which are perfect for stargazing. 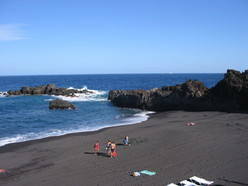 One of the sand beaches at Los Cancajos, just 12 km away. Along with an adjoining bay, it's excellent for snorkelling with clear water and abundant fish.